You've found the “U.S. 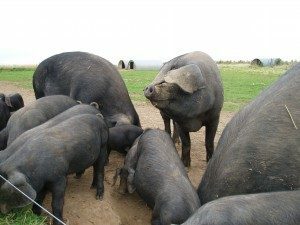 Large Black (Devon) Pig Breeders” page here at Hobby Farm Wisdom! If this is the first time you have visited our site: Welcome! Large Black, also known as Devon or Cornwall Black, is a breed of domestic pig originating in Great Britain. They were developed by breeding local pig breeds from West Country and East of England. Large Black pigs are true to their name with a very large body that is entirely black. This breed is quite docile, partly due to its large ears that droop forward and obscure its vision. Large Blacks are an excellent breed for extensive farming because they are strong foragers but have declined in popularity as more farmers want breeds that are suitable for intensive farming. This breed has a reputation for its long periods of fertility and excellent ability to raise large litters. The meat from a Large Back is considered very lean and flavorful without a lot of fat. Today however, most commercial productions do not care for the black skin of a Large Black.